Terminalia ferdinandiana, a small deciduous tree that grows across coastal monsoonal northern Australia, is known in each indigenous community by its local name. 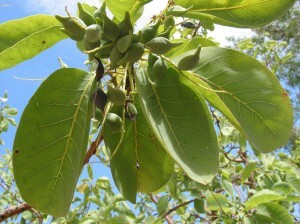 The people of the Kimberly region of Western Australia know the plum as gubinge or kabiny and it is referred to as ‘Migorayi’ in the Marrithiel language of the Delye outstation area of NT. It is more broadly known, both nationally and internationally, as the Kakadu Plum. The Kakadu plum has been consumed by Aboriginal Australians for thousands of years for its nutritional and therapeutic value, with the inner bark of the tree being used to treat skin disorders and infections, and the fruit itself rich in anti-oxidants and bio-actives. It is recognised as the world’s highest natural source of vitamin C, with concentration more than 50 times that of an orange. The Kakadu plum contains acids that have anti-viral, anti-fungal, anti-inflammatory and antibacterial qualities, thereby classifying it as a super-fruit that could be used in treatments for diabetes, cancer and Alzheimer’s disease. It is a thirst-quenching fruit, with a tart taste and a delicious aroma of stewed apples and pears.